Season food like a member of a merengue band with these hand-carved salt and pepper shakers. A well-seasoned meal is a good meal, and a good meal: That's music to our ears. With these maraca-shaped salt and pepper shakers, you'll season food like a member of a merengue band would. The playful take on a common household set is hand-carved from rich, sustainable sheesham wood, polished, and etched with an 'S' and 'P' for easy identifying. Give the set to a friend or loved one who appreciates good food and a good beat. Designed by Kaushal Goyal. Handmade by artisans in India. Kaushal Goyal might be an electrical engineer by trade, but his craft has less to do with technology. A self-made sculptural artist, Kaushal experimented with different techniques—from clay to woodworking—during his free time in college. After graduation, he joined his family’s electronic manufacturing business, but he couldn’t shake his love for the smoothing, shaping, and sanding. Eventually, he left the family business to bring his one-of-a-kind artworks to customers around the world. 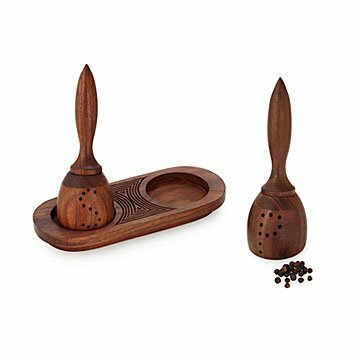 His designs, like the maraca salt and pepper shakers and cermanic tea strainer, are exquisitely crafted and bring a touch of beauty to your kitchen.